That is a statement we often hear from students and alumni as they describe their first memorable visit to the College of Arts and Sciences. Thank you for visiting us on the Web.  We like to say that the College of Arts and Sciences is how college was intended to be — a place where thinking and learning are exciting, where you will find your window to the world and your place in it, and where you will meet a diverse group of classmates, many of whom will become your lifelong friends and colleagues. Whether you are interested in the mysteries of deep space, literature of the South, the secrets buried in ancient Native American dwellings, or how global political change affects our national security, the College of Arts and Sciences offers you rich territory to explore. We’re proud of our many students who have earned the College a national reputation for academic achievement that includes 13 Rhodes Scholars, 11 Truman Scholars, 32 Goldwater Scholars, and 39 USA Today All-USA Academic Team members. The College’s mission is focused on your academic growth and our faculty are nationally recognized for their commitment to it. At this college, you’ll be learning with internationally renowned teachers and scholars dedicated to sharing their knowledge with you. You will find information about all of our programs and people here. I especially recommend that you review the College of Arts and Sciences’ section of the University catalog, where you will find a listing of courses offered and requirements for our many programs of study. Then, browse the individual websites for the departments and programs that interest you. Our advising pages will take you to our frequently asked questions and to an advisor who can tell you more. Then, feel free to contact us for more information. Enjoy exploring our site and, again, welcome to the College.